Going Nutty! 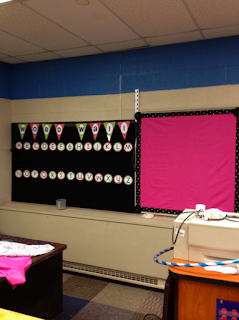 : Word Wall Woes Wiped Away! I love Wal Mart's twin sheets for covering my bulletin boards! It does seem like those little bags should be good for something! 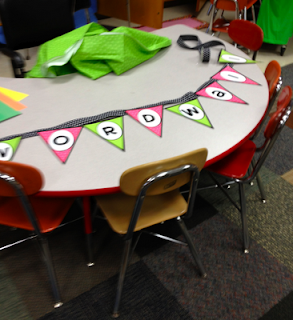 I like this idea of using foam board for the word wall, I might use it, but not attach it to the wall. I used a Walmart sheet too cover some shelving. 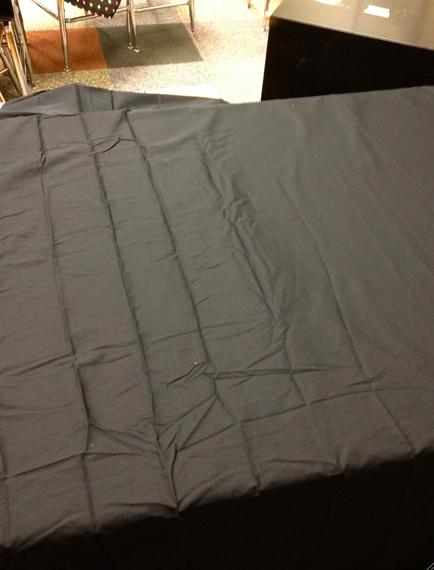 It was much easier (and actually cheaper) than buying the fabric to make covers myself... The bag baffles me though! 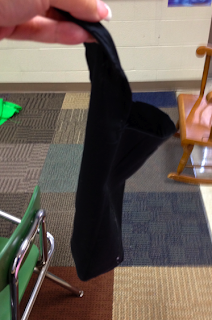 I refuse to throw it away because I know I will be able to find something to do with it! First, freakishly I was just listening to this TED on my way to the lake tonight. Erin McKean says that if you love a word that makes it real, just like the velveteen rabbit. I love velcroed, so from henceforth it is a real word and we may use it proudly. Second, that sheet fit in that little black sock? Weird. Third, household cheat: throw that sheet in the dryer with a wet towel and blow that baby smooth. Fourth, Command strips are the adhesive of the gods. My entire room is hung with them this year, because we have an in at 3M and we got like a bazillion donated to us. Sixth, you can set blogs to publish? Really? Really, really truly? Hmmm, I feel a novice blogger post coming on. bahahah! I'm just not strong spatially! And I feel like time zones are a spatial thing! Love your word wall!!! Now if I only had the wall space to put the word wall on.........I actually have a space for words but would love to put one of your thingy walls up to put other things up.......hmmmm:) Your glue gun in a holster is hilarious....I have a visual now;) Loving you bright and cheery blog design! I am sooooo behind on reading...I missed the debut!!! ok I am waaaaay and embarrassingly behind, I'm sorry. When did you change your design?! I love it!! And your room!!! It looks awesome! 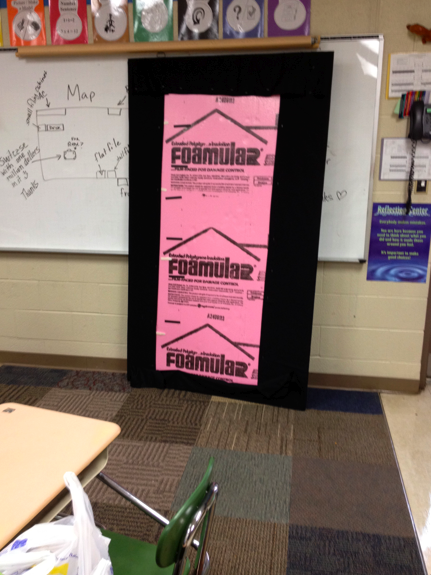 The foam board is sheer brilliance! Love it!! And, I LOVE command hooks/tape/whatever they make...it attaches to anything and holds! I love that idea! I will have to look around my room for a place to stick a word wall on insulation now! You, my friend, are a genius. And I am in love with the color scheme and pennant border!!!! 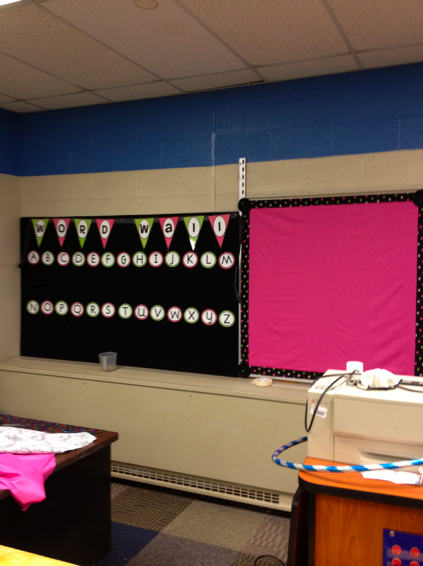 Love the foam board idea! 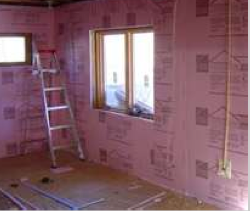 We recently insulated our basement with it but unfortunately hubby covered it with dry wall. Had I know your little decorating tidbit I would have a much fancier basement! I am totally late to the party on this post but YOU ARE BRILLIANT! I am so going to use your brilliant brain to my advantage. Thank you for solving like 5 problems for me in my new room. What a fantastic idea! 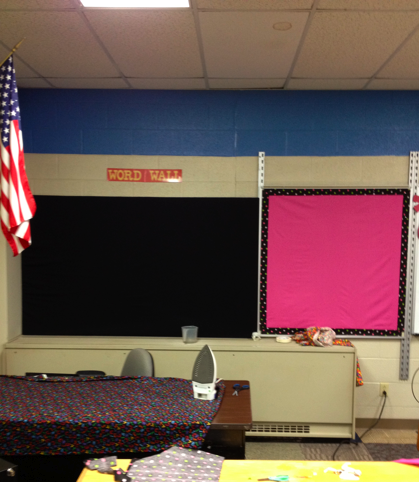 I have three walls that are screaming for staple friendly bulletin boards! Thanks for the ideas! This. Is. Genius! Thanks for the inspiration! 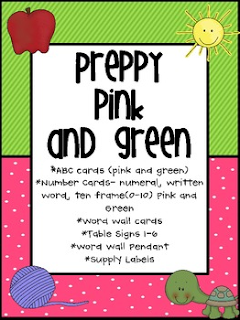 My room is bulletin board-less, so I'm looking for any way to get student work and word walls up without constantly having to staple the wall to death. Did you use the regular command strips or the ones that look like Velcro?